I’m going to through out the whole LC match I have for 80m. I checked the antenna before the contest and that time the SWR 1:1.3 seemed great. I don’t know how/why but when QSYed to 80m the SWR sporadically started to jump up and down peaking up to 1:3+. I buggered something up in the box as it was flawless before I tried to extend the 80m Inv-L to include 160m as a duobander. This is the 3rd contest turned into disaster due to 80m. I did not want to risk the transceiver I gave 80m up. Only picked couple of Qs with reduced power but the antenna felt as a buried dummy load… I definitely lost on this band. 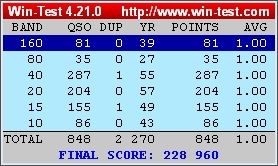 My goal was to reach 900 qso in total which would almost have been feasible even without 80m. SO1R2V with no moves which is painfully visible on the mult total. I’m sorry Vlad, UA6GO. Missed the VFO swap back and accidentally started to CQ on your freq. Apologies for that.